Welcome to Tom's Bulldog Diesel Repair, your local auto repair shop in Coos Bay and North Bend. Keep your truck running smoothly and avoid future repairs with a regular service schedule. From oil changes to timing belt replacements, and fluid flushes, we've got you covered for Diesel Service. Dont trust just anyone to work on your Ford Diesel Powerstroke Engine. Some mechanics will throw parts at your truck until it works. We have the technical knowledge and expertise to recommend the right Powerstroke Repairs. Bringing your Duramax to our shop means that your vehicle will not only be fixed and maintained properly, but also treated with the respect it deserves. We are committed to honest, reliable service and performing quality Duramax Repairs. Is your Cummins engine making strange noises? Automotive diesel engine systems can cause complicated and frustrating issues. Our auto repair shop offers everything from basic maintenance to major Cummins Repair and diagnostic services. "They were very friendly and professional. The shop workers are.."
"Best shop in the area. They went far above what.."
"Someone that grew up with parents who owned a business,.."
"If they went anywhere else they would not and could.."
"They do very thorough work and are good at diagnosing problems." 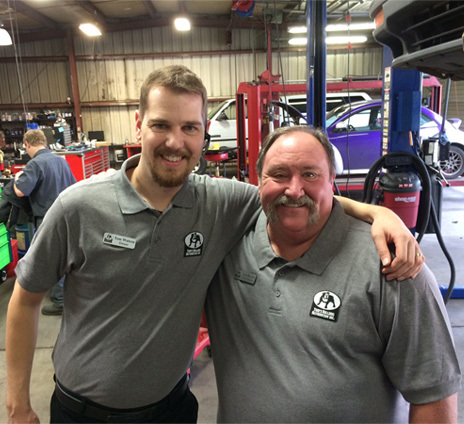 "They wouldn't find a more trusting personnel and best results.."
"I would highly recommend this shop! It's great family friendly.."
"They provided good service and were courteous." "I highly recommend this shop! Customer service is best I've ever had"
"Fast, honest, efficient, and the whole showing you all the.."
"top quality service and people that care I was very.."
"It is the most informative experience I've ever had at.."
"Service was great and customer service was great. It did.."
"Every time I have had service work done, Tom and.."
"excellent. Provide ride to and from home to deal with.."
"I would recommend Tom's to them." "Great service, via word of mouth, you are a company.."
"I would tell them that Tom's was a great place.."
"I had my check engine light come one, they got.."
"I appreciate the personal service I get and I trust.."
"Great Customer Service! Fast Service! Quality Work"
"Tom's Bulldog Automotive is a really honest and up front.."
"I have spent hundreds of dollars repairing and maintaining my.."
"Outstanding customer service and mantenience." "The most professional and friendliest business we have been to.."
"Very proffesional facility capable of almost any repair or maintenance.."
"Excellent customer service work was completed on time and beyond expectation"
"Tom is always Friendly, courteous and polite. Very professional and.."
"Tom's Bulldog Automotive was recommended to me by my local.."
"Excellent service and are extremely efficient." "I had an issue but tom corrected it as soon.."
"Very nice people, complete service with a smile. They seem.."
"The best in the area for automotive repair and maintenance." "It was very professional and they fixed the problem. Plus.."
"It's the most honest place in town and the best customer service"
"I am completely satisfied with the service that I received..."
"I have had my vehicle service at Tom's Bulldog Automotive.."
"Angels in auto repair! What a wonderful shop family!" "Quote might be higher but it is very solid. Work.."
"They are friendly, thorough and professional, and they put the.."
"Great! And they vacuum your car!!!"